Wow, May is busy. May is for celebrating all things coming to an end (like graduation) and gearing up for everything beginning this summer. Last week we threw a fun little birthday party for my niece who has been living with us, she turned 16! I had all of these grand intentions to post all of these great blog posts, but then Silas got sick and it just didn't work out. That's just life sometimes. So I'm back tracking a little this week, trying to get caught up and moving forward with all of the big youth events we have waiting in the wings over the next couple of months, gearing up for a new big blog series: Share Your Story and trying to throw in some home diy projects in the midst of it all. I might be over-reaching it here. Thanks for sticking in there with me and being awesome. This is pretty much the party on a table, minus just a few things. I did everything on a tight budget and handmade most of the decorations. The dollar store, the Target Dollar spot and AC Moore's $1 bin were my best friends. My niece Ashleigh is a fan of all things purple, green and orange so that was the color theme we went with (with a little black thrown in). I was afraid of it looking too Halloweenish but I felt like we had enough range of color to pull it together. Ashleigh loves different and funky so it was perfect for her. 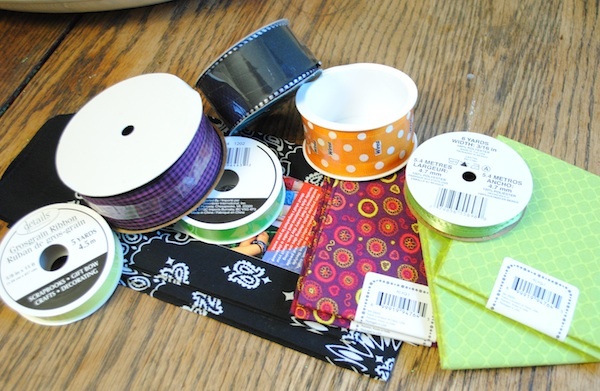 Like I said, the $1 bins were my friends and all of my ribbon and fabric came from there, I was so excited to score this purple, orange and green patterned fabric at AC Moore, I felt like it tied everything together. So I'm exited to share with you just what we did with all of the things purchased and laying on this table so be on the look out for that. Tomorrow I'm having a little kick-off for our new blog series - Share Your Story. I'll be sharing all of the details and reasons behind my desire to do this. Can't wait!! This looks so cute! I love finding cute ribbon on sale. 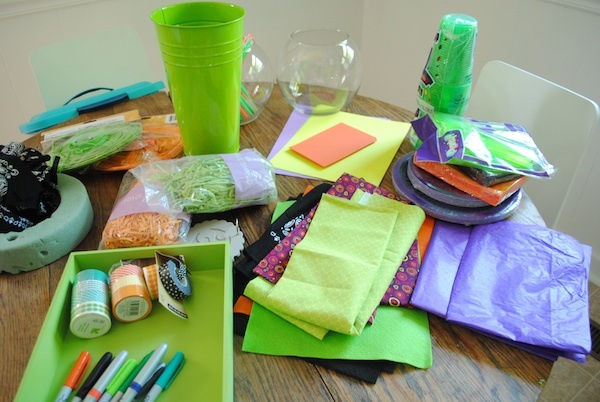 I have done a few blog posts with a photo of discount craft stash like this, teasing into a DIY party :D SO fun to make magic happen on a budget! 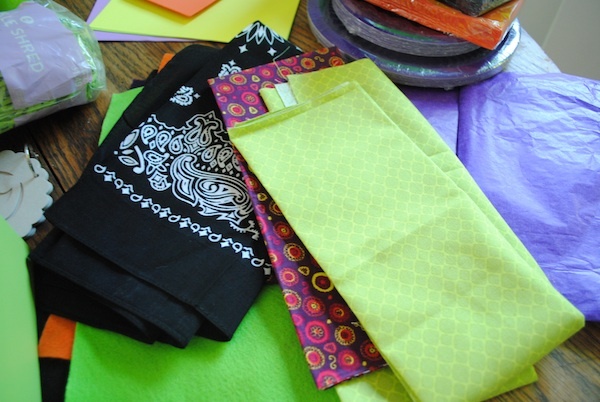 I'm looking forward to seeing what you created for your niece's party! A new blog series, you say?? I'm intrigued!